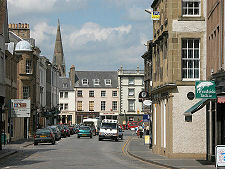 Kelso is said to be the most architecturally attractive of the Border Towns, and it is easy to see why. 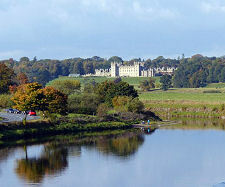 The town is set within a bend in the River Tweed, and opposite its confluence with the River Teviot. 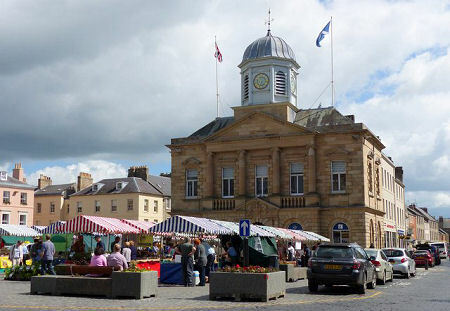 At its heart lies the largest Market Square in Scotland, a large cobbled area that gives Kelso a distinctly continental feel. At the centre of the Square is the marking in the cobbles showing the Bullring, where bulls were tethered during during cattle markets. 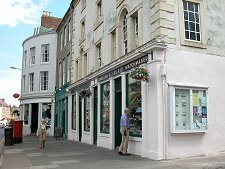 The importance of early Kelso as a centre for commerce is confirmed by the names of the parallel streets running north east from the Square: Woodmarket and Horsemarket. Overlooking the square and set between Woodmarket and Horsemarket is the imposing Town House. This was built in 1816 to replace an earlier thatched Tolbooth: today the ground floor is home to an excellent Tourist Information Centre. 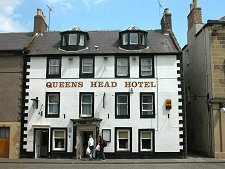 The north side of the Square is dominated by the Cross Keys Hotel, a coaching inn built in 1760, but given an Italianate look (and an extra floor) in a makeover in 1880. 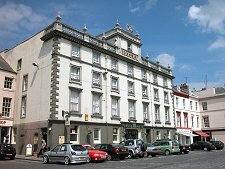 An attractive building, the Cross Keys Hotel brings a touch of the central European to the Square's continental flavour. The story of Kelso might be subtitled "Two Castles and an Abbey". 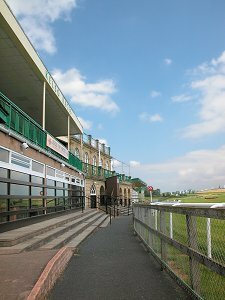 The original focus of development lay a mile to the west of today's Kelso. Marchmount Castle, on a neck of land between the Tweed and the Teviot, was well established when King David I renamed it and the settlement around it Roxburgh, or "Royal Burgh" in 1124. Four years later, in 1128, David I set up Kelso Abbey in a curve of the River Tweed a mile east of Roxburgh Castle. 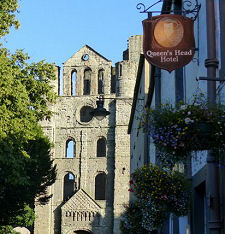 The fragmentary remains of the abbey can be seen a little to the south of Kelso Square, along Bridge Street. 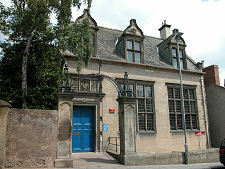 The settlement that grew up around the abbey became the nucleus of today's Kelso. Roxburgh Castle became the focus of repeated conflict between Scotland and England after being surrendered to the English in 1174 as part of the settlement for the release of King William the Lion (see our Historical Timeline ). The Scots briefly retook it in 1314 but then lost it again. Repeated efforts to retake it continued into the 1400s: and it was here that James II was killed in 1460 when a cannon with which he was attacking Roxburgh Castle exploded. The Scots dismantled Roxburgh Castle after finally taking it in 1460, and the settlement serving it then declined. 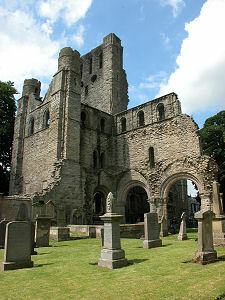 Kelso Abbey was largely destroyed by the English in a series of attacks culminating in 1545. The Reformation in 1560 ensured recovery was not possible. In 1607 the abbey lands were acquired by Robert Duke of Roxburghe, whose family home was at "Fleurs" Castle, on the north side of the Tweed to the west of Kelso, opposite the site of Roxburgh Castle. Today's Floors Castle dates back to a major rebuild in 1721 and is the largest inhabited mansion in Scotland. 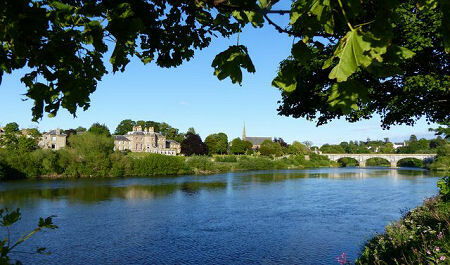 Its grounds constrain the western side of Kelso and include much of the area occupied by the original settlement of Roxburgh, of which no trace now remains above ground.